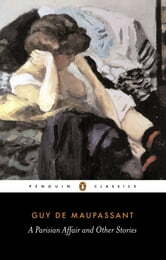 Set in the Paris of society women, prostitutes and small-minded bourgeousie, and the isolated villages of rural Normandy that de Maupassant knew as a child, the thirty-three tales in this volume are among the most darkly humorous and brilliant short stories in nineteenth-century literature. They focus on the relationships between men and women, as in the poignant fantasy of 'A Parisian Affair', between brothers and sisters, and between masters and servants. Through these relationships, Maupassant explores the dualistic nature of the human character and his stories reveal both nobility, civility and generosity, and, in stories such as 'At Sea' and 'Boule de Suif', vanity, greed and hypocrisy. Maupassant's stories repeatedly lay humanity bare with deft wit and devastating honesty. THE HORLA / LE HORLA Illustré par JULIAN DAMAZI.